Air Canada Rouge is selling off some last minute seats to Saint Martin, the beautiful island in the south Caribbean, for $298 CAD roundtrip including taxes. Apr 17 to Apr 24 -- new! Where to stay on St. Martin ? The following AirBNB links will lead you to some great deals on places to stay on St. Martin for under $119 CAD/night for 2 people. You could also try VRBO, which is showing around 18 properties for under $100 USD/night. Just run a search for St. Martin when you get there. After you hit Search you can apply the price filter. 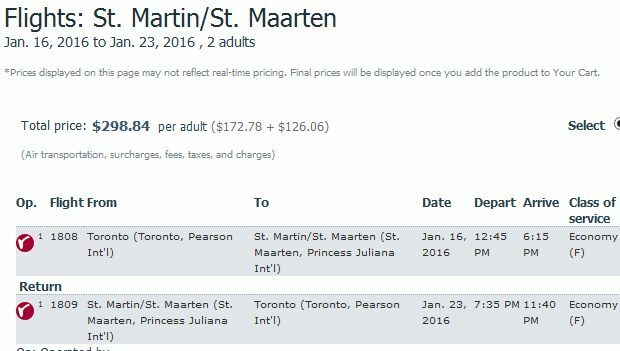 toronto, yyz, caribbean, flight deals, southern caribbean, netherlands antilles, air canada rouge, lesser antilles, leeward antilles and sint maarten. 5 Responses to "Toronto to Saint Martin, South Caribbean Island - $298 CAD roundtrip including taxes"
Love your emails and this sounds amazing, but once it's in my cart the price doubles (see below) ... am I missing something? Yep, the AirCanadaVacations website is set to search for 2 passengers by default, even when searching for a flight, which is different than most search engines (typically most sites are set to search for 1 passenger by default, when it's a flight). This is a super amazing deal. Just went there in November. Would go back if I could find the time. Don't miss out, our flights were $900 return WJ each person in Nov. Thanks for sending all these great deals. I am trying to book for Jan 16 to 23 and the prices about 2300 per adult - am I doing something wrong?